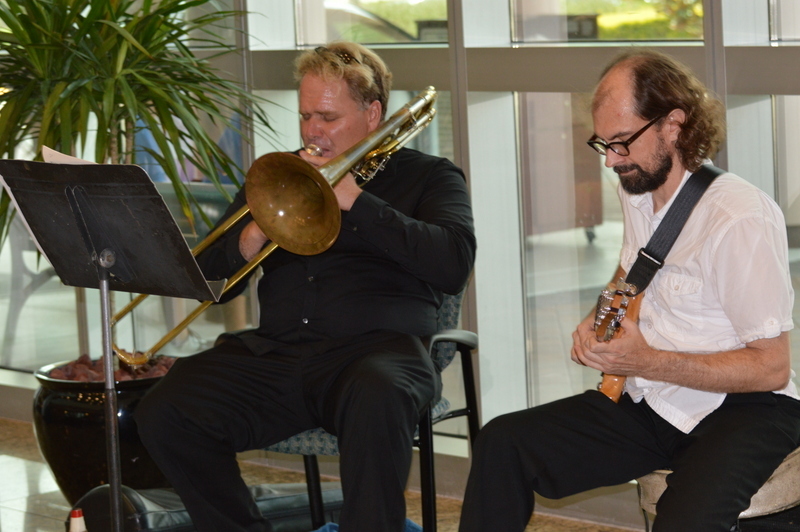 DUO BRUBECK, featuring Tom Lippincott, is an exciting and innovative jazz duo which celebrates the rich tradition of guitar and trombone duos, with a twist! Inspired by the jazz duos of Bob Brookmeyer and Jim Hall, Tuck and Patti and J. J. Johnson and Joe Pass, Brubeck and Lippinocott met while students at the University of Miami in 1989. 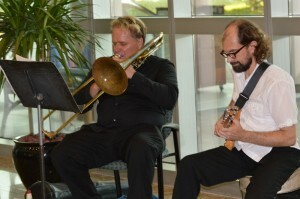 Both musicians played guitar and trombone in their youth only to choose different paths. David & Tom’s love of these timbres and their combination have led to the creation of ‘Duo Brubeck’. A lifelong devotee of jazz improvisation, Lippincott was inspired by the piano, “Although I love the guitar, I’ve often been envious of some of the things pianists can do that guitarists cannot. In my quest to be able to play more extensive contrapuntal ideas and play chords with more notes that cover a wider range, I thought: why not have a guitar built with both?” Lippincott’s solution was to seek out an eight string guitar. The guitar he chose features an additional B, (a fourth below the traditional low E), and another A a fourth above the top string. The Eight String Guitar has allowed Lippincott to expand the roles of the guitar to simultaneously play bass, melody, and chordal extensions. Brubeck’s divergence came at the age of 14, when he fell in love with the bass trombone, rather than the more typical tenor trombone. This lower voiced instrument is typically melodic, or provides a rhythmic bass. Inspired to combine both melody and bass lines by alternation, Brubeck created an implied homophony reminiscent of jazz vocalist Bobby McFerrin. Brubeck’s original solo compositions for bass trombone using this technique are entitled ‘Stereograms’. More than 30 have been published by the International Trombone Association, and have been performed and recorded around the world, and even been adapted for baritone saxophone and tuba. DUO BRUBECK combines both of these approaches to create a truly unique and seamless weave of melody, chords, and bass lines from instrument to instrument. The glistening sound of DUO BRUBECK is a fascinating and pulsating rhythmic melange of complimentary waves of sound.